A very colorful and eye-catching suncatcher/ornament. The body of the piece is a textured glass disc that is covered in various shades of dichroic glass and then given a half twist. The disc has a teardrop of clear glass as a finial on its bottom and the margins of the disc are cased with three clear beads. 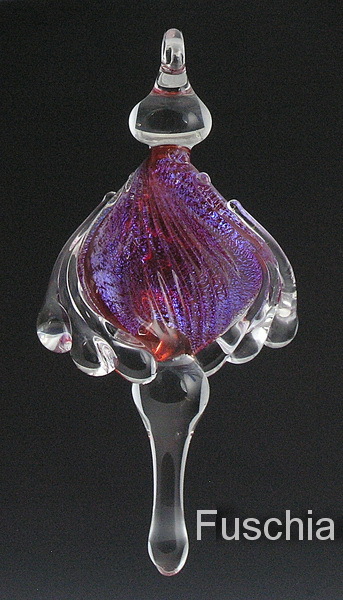 The top of the piece is finished off with a disc of clear glass with a sturdy loop at its top. The ribbon ornaments are about 4 inches in height and 2 inches across the widest mid-section. These ribbons put on a fantastic light show when hung in a bright light (better yet, sunlight) and given a spin.